The disc is the R&B singer's first record since 2012's Looking 4 Myself and he has made some big changes to the venture along the way. Earlier this year (16), he revealed it would be called Flawed, after previously claiming it would be titled UR after his full name, Usher Raymond. On Thursday (25Aug16), Usher finally confirmed its new title and unveiled the album's artwork during an appearance on U.S. late night show Jimmy Kimmel Live!. The album's cover features a stone head, bearing a resemblance to the 37-year-old, with cracks on the cheek and the words 'HARD II LOVE' scrawled in white chalk along the neck. "Hard II Love. Pre-order now," Usher wrote on Twitter alongside the photo, before thanking host Jimmy Kimmel for welcoming him onto the programme. The record will hit retailers on 16 September (16) and feature singles No Limit, featuring Young Thug, and Crash. Another offering on the 15-song track list, which has been released on iTunes, is Champions, a track made for his new movie Hands of Stone, in which he portrays real-life boxer Sugar Ray Leonard, opposite the likes of Robert De Niro and Edgar Ramirez in the sports biopic, which chronicles the life of famed fighter Roberto Duran. 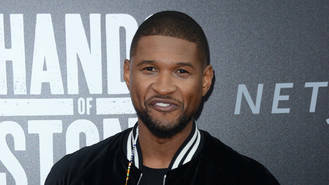 Fans have been eagerly anticipating Usher's eighth album for some time now, especially after the singer divulged a few details about the material - then titled Flawed - during the Cannes Lions Festival in June (16). "I find the inspiration every time I find a word: What is 'flawed?' It's something that is not perfect. It's a future relic of some sorts, to grow and blossom and gain texture," he mused.